The Iraqi Emergency Response Brigade (ERB) is a component of the Ministry of the Interior, specifically structured as a counter-terrorism force responding to attacks within the borders of Iraq. Since 2016, however, ERB forces have been serving in an offensive capacity alongside Iraqi Special Operations Forces, particularly during the ongoing battle for Mosul. As the fighting has progressed, the weapons and equipment employed by ERB have evolved from those more suited to law enforcement to those enabling their current military role. This has included the addition of rocket launchers and recoilless weapons, vehicles, and large-calibre precision rifles. 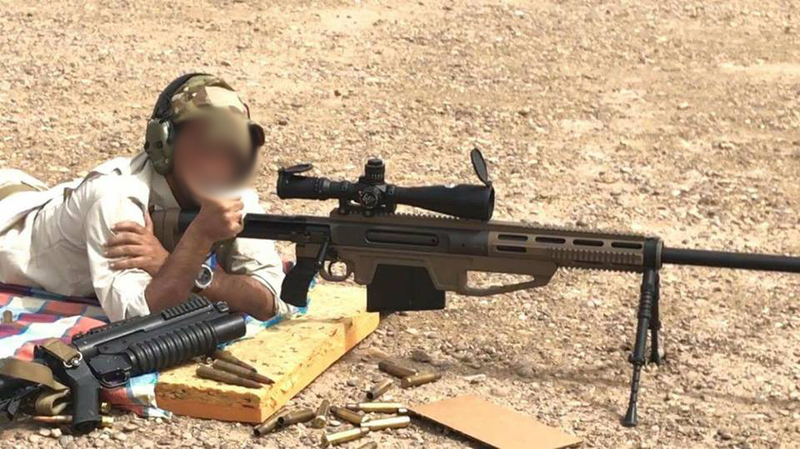 One of the latest additions to their small arms inventory is the .50 BMG (12.7 x 99 mm) HSR Cyclone from Steel Core Designs, based in the United Kingdom. Steel Core Designs is a relatively new precision rifle design and manufacturing firm, with a product line of bolt action, magazine fed rifles chambered in 7.62 x 51 mm, .338 Lapua Magnum, and .50 BMG. The HSR Cyclone uses a 4-lug locking bolt, which Steel Core Designs claims incorporates an innovative firing pin system. They note that “the short firing pin travel enables a very fast lock time (firing pin release to primer impact) of around 1.5 milliseconds”, which should provide some limited benefits for accuracy. 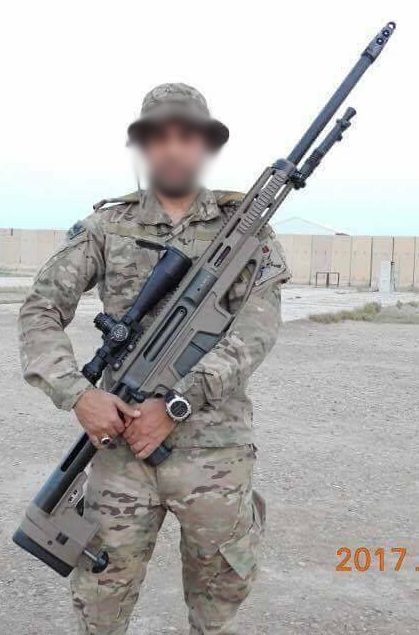 Recent social media posts from Iraq have shown numerous HSR rifles, chambered in .50 BMG, in the hands of ERB personnel both in a training environment on a static range and in use during the battle for Mosul. HSR Cyclone rifles in service with ERB are fitted with Nightforce variable-power scopes and are supplied in a standard configuration from Steel Core Designs. Ammunition used appears to be a combination of standard .50 BMG ball ammunition (typically employed with M2 series heavy machine guns), and match grade armour-piercing cartridges produced by General Dynamics Ordnance and Tactical Systems–Canada. It seems probable that the unlinked M2 ammunition is most likely used in training, while the AP rounds are more likely used in combat. 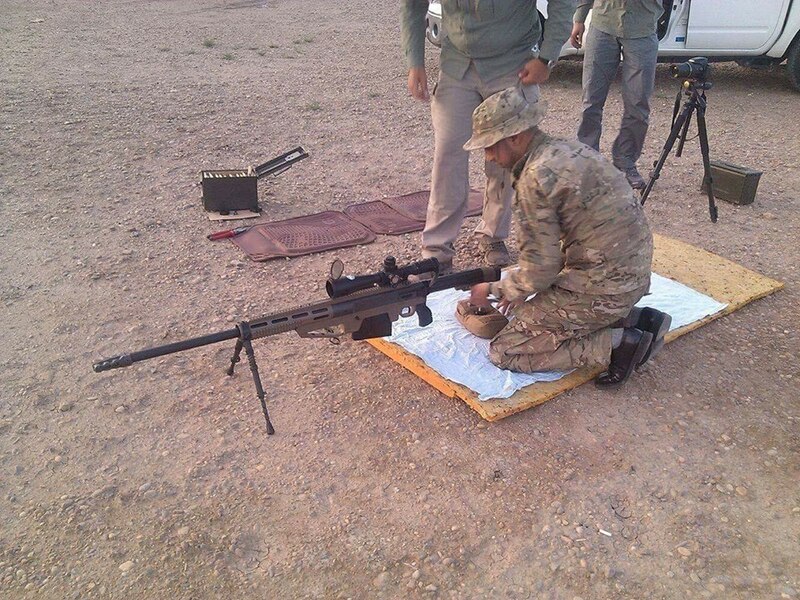 Using re-purpose, unlinked machine gun ammunition is a practice also seen with ISOF forces, and appears to point to a shortage of match grade precision rifle rounds in the Iraqi supply system. The operational need for such rifles has been driven primarily by the so-called Islamic State’s (IS) use of heavily-armoured suicide vehicle-borne improvised explosive devices (SVBIEDs) throughout the Mosul campaign, and during the current conflict in Syria. Forces fighting IS have employed various solutions to this problem, including developing improvised homemade anti-materiel rifles, often converting 12.7 mm DShK/DShKM and 14.5 mm KPV heavy machine gun barrels to bolt-action rifles. Where available, ATGWs have been used, but the high per-engagement cost has meant that large-calibre precision rifles remain in demand.